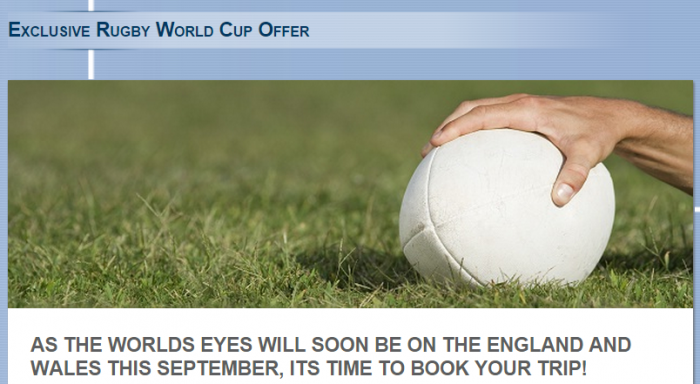 Apparently there is a Rugby World Cup in England and Wales this autumn and Le Club Accorhotels is offering 250 or 750 bonus points for stays at participating hotels in the UK & Ireland from September 16th to October 31st, 2015. You can get 750 points for making the reservation between April 1 and May 31 or 250 bonus for reservation done between August 1 – September 16. Both of these offers require registration. You can access and register for the 750 bonus points offer here and for the 250 one here. It is unclear how many times you can earn this bonus. The T&C’s state that at any one of the hotels, but then the text itself refers to “stays”. It is weird that Le Club Accorhotels advertises this as a Rugby World Club promotion, but seems that the offer is available in all of the UK & Ireland, although there is the “participating hotels” caveat. They are not listed anywhere. 1. General Le Club Accorhotels terms and conditions apply to the “World Cup Bonus” offer. 2. This offer is valid for a stay from “16/09/15” and “31/10/15” in one of the participating hotels in “United Kingdom & Ireland”, and booked between “01/04/015” and “31/05/15”. 4. You must register for this offer to qualify for the offer. 5. To benefit from this offer, your booking must be made on Accorhotels.com or our participating brands web sites, via the accorhotels.com application or via Accor call centers. All other reservation channels will not be eligible to this offer.